You may have spotted my post offering a one day only early Christmas deal with a 40% discount on a set of August MS515B Bluetooth Speakers. Sold on Amazon for £29.95. For sharing August Lab’s early Christmas deal I was given an awesome discount on the bluetooth speaker myself & ordered them first thing Thursday morning when the discount codes went live. Friday morning we received our email letting us know our parcel was being delivered later that day! This made me pretty excited as A) I LOVE opening parcels 😂😂 & B) I love listening to music! Especially when cleaning & these can easily be moved around room to room without disturbing the music! Our parcel arrived around about 4.30pm and we quickly got the box opened up to have a look inside. I checked the manual and got them plugged in to charge up & was really impressed by how easy they are to set up. They come with a USB lead with a split lead to charge both speakers at the same time. The speakers connect by a lead included in the box. They also have an AV in lead so you can plug them in to devices without bluetooth. So you can literally use them with anything! I quickly got my phone connected via bluetooth to test them out and was amazed by the sound quality. They are pretty loud too! For small speakers they really do have some power. Anything with bass (when up loud) makes them jump across the side a little which really amused Eva. We had them set up in the kitchen and the sound filled the room & we all ended up dancing in the kitchen whilst I cleaned & the Mr cooked for the girls. The Mr loves music too and has play-lists saved on his youtube. He eventually got bored of typing in each song on my phone. He decided to connect his phone to the speakers instead and took over with his play-lists for a good hour. 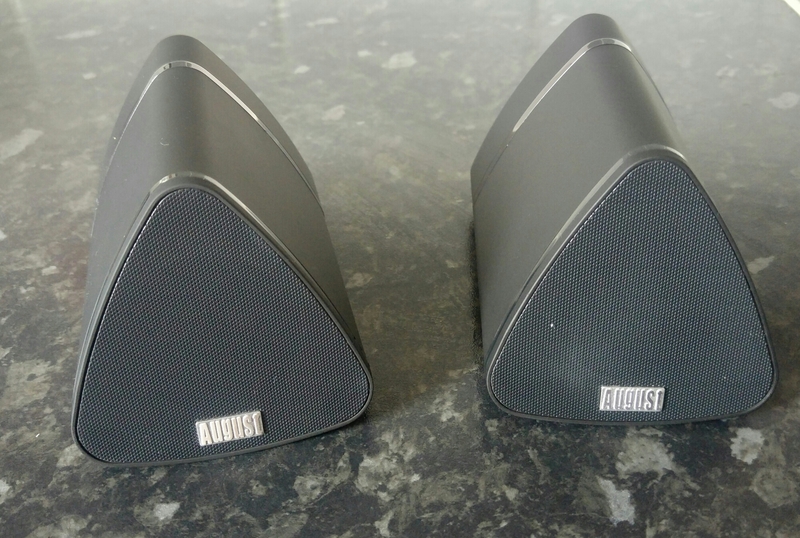 We are seriously impressed with the quality of the bluetooth speakers. Especially for only £29.95 (Unless you used my discount code 😉 ) delivered the next day even though we chose the free delivery option! I love that the girls can connect using the Tablet as well as us using our phones & pc/laptop and as they are rechargeable we can take them anywhere. I’ve yet to find a problem with them. I like that I can skip forwards and back a track using the button on the back of the main speaker. *This is a sponsored post & I received a large discount on the speakers in return for sharing the 40% off discount post and an honest review. 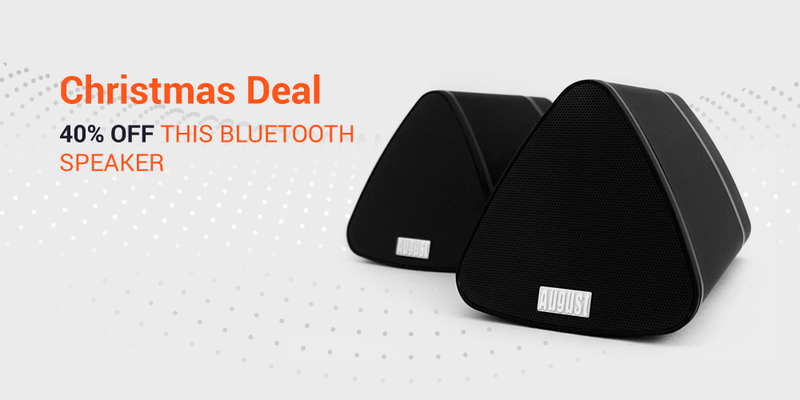 August MS515 Bluetooth Speaker – One Day Only Early Christmas Discount! As my readers will know I’m already planning ahead for christmas & with less than 17 weeks to go I’m on the hunt for awesome bargains and discounts to go under our tree. As I mentioned before I’m thinking about getting Izzy a Tablet for Christmas as she loves Eva’s & was struggling to think of a present for Eva but then I came across an offer* from @August_Lab for a set of August MS515 Bluetooth Speakers & knew she would love them for playing music in her room from her tablet. I know a lot of my readers love technology and also love a good bargain so if you want to get yourself an early christmas bargain with 40% off these August MS515 Bluetooth Speakers on Amazon (currently £29.45) Just click the link & enter your email and your coupon code will be emailed to you on September the 8th for a one day only special christmas deal! Not sure if these are the bluetooth speakers for you? I’ll be writing up a review on these myself so check back soon to read what I think. *This is a sponsored post in return for a discount on the product mentioned.